Cumulus is available free on the cover-mounted DVD of Computer Music magazine from issue 170 and onwards. 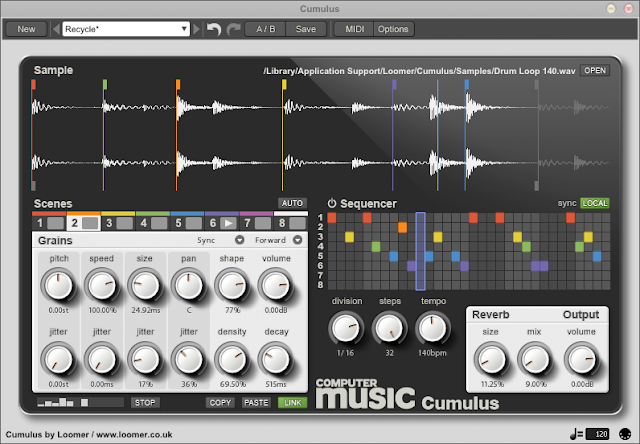 Cumulus is supported on Mac OS X (VST, AU, RTAS, and Standalone), Windows (VST, RTAS, and Standalone), and Linux (VST, Standalone), and natively supports 64-bit for VST, Audio Unit, and Linux Standalone formats. It seems like a rogue bug managed to slip under the radar in Aspect 1.7.6. I'd recommend anyone who downloaded it to update to Aspect 1.7.7. This release fixes a critical bug in Aspect 1.7.6's audio synthesis engine which caused certain presets to sometimes have a transient gliding pitch at the beginning of a note. Which did admittedly add a certain flair to presets, but is, none-the-less, a bug which needed to be fixed! The Loomer mailing list is now active: sign up here. You'll receive the occasional email about new releases, as well as news on plug-in updates, and on anything else interesting we've been working on at Loomer HQ. Preset searches are now multi-threaded. Preset browser can now immediately respond to user interaction, even whilst searching a massive preset library, or when browsing a folder containing a large number of presets. Preset meta data (ie, author name, notes, tags) is now correctly displayed after loading an .FXP based preset or restoring a saved project. Vastly improved CPU usage when recalculating DSP graph as a result of realtime re-wiring of a modular preset. Standalone application tempo can now be set to within two decimal places of accuracy. Fix for GUI freeze that could occur in certain Mac OS X VST hosts. Fix for LFOs being incorrectly reset every four bars when using the standalone application. Fix for minor issue which caused a changed preset to temporarily be reverted to its original state when previewing presets via the browser. Manifold and Resound for Mac OS X have been updated to 1.6.1. These releases add a fix for an issue that causes the preset browser to become invisible when either Audio Unit plug-in is hosted by Digital Performer. Open the corresponding configuration file, ~/Library/Preferences/Loomer/Resound.xml or ~/Library/Preferences/Loomer/Manifold.xml . All new instances of the Audio Unit plug-in will hide the legacy Carbon UI, forcing Digital Performer to use the more compatibile Cocoa UI. Download Manifold and Resound 1.6.1 for Mac OS X here.